I’ve always been intrigued with Spaghetti Squash since I was a kid, Really -a squash that cooks into strands similar to spaghetti – how fun is that! Spaghetti Squash is a wonderful side dish and I think I’ve found my new favorite way to serve it. 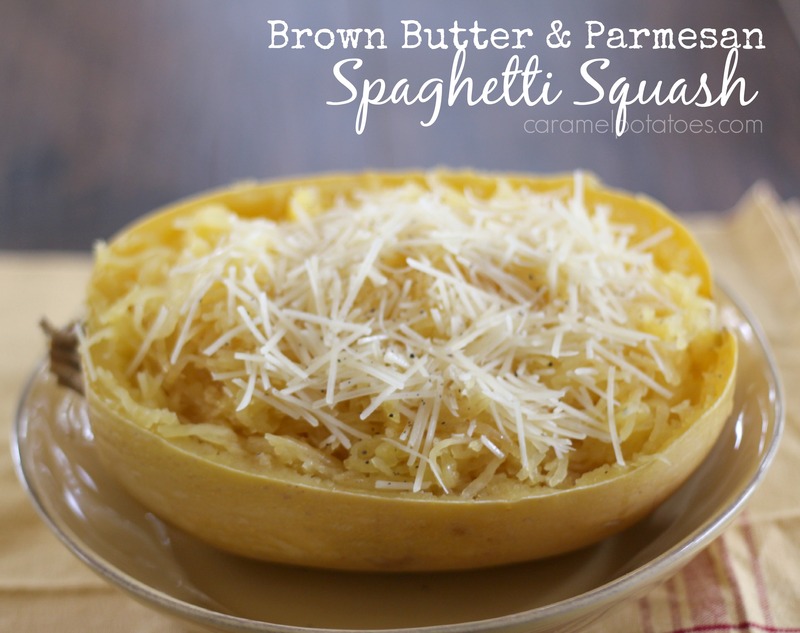 This Brown Butter and Parmesan Spaghetti Squash combines a simple drizzle of brown butter to add a rich, nutty flavor and is topped with flavorful Parmigiano-Reggiano Cheese – Delish! I love the awesome flavor of brown butter for fall. Try it in these Mashed Potatoes and this Orzo Pasta for more rich wonderful fall sides. 1 spaghetti squash, 2 1/2 to 3 lb. Place the whole squash in a large pot and add water to cover. Bring to a boil over high heat, reduce the heat to medium-low and simmer, uncovered, until the squash can be easily pierced with a knife, about 45 minutes.Meanwhile, in a saucepan over medium-high heat, melt the butter and cook it until it turns brown and just begins to smoke, 3 to 4 minutes. Remove immediately from the heat and stir in the nutmeg. When the squash is done, drain and set aside until cool enough to handle. Cut the squash in half lengthwise and, using a fork, scrape out the seeds and discard. Place the squash halves, cut sides up, on a serving platter. Using the fork, scrape the flesh free of the skin, carefully separating it into the spaghetti-like strands that it naturally forms. Leave the strands mounded in the squash halves. If the butter has cooled, place over medium heat until hot. To serve, drizzle the butter evenly over the squash. Sprinkle with the cheese and season with salt and pepper. Serve immediately. Serves 6.